Every week, we automatically create a backup for you. New backups overwrite the snapshot from the previous week. If you like, you can manually create a backup any time. When you create a backup file manually, the previous manual backup file is overwritten. 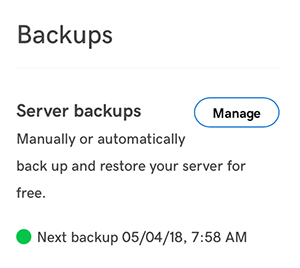 Next to the Generation 4 server you want to back up, click Manage.